RG and JR, being younger and engaged, have got the double bed. The gf and I have 2 single beds separated by a narrow gap. We don't mind, it's a laugh to hold hands across the gap like naughty kids. As ever I'm up before the gf but contrary to the norm I'm not in a rush. If, if perchance the weather is OK today I reckon we should go to Fort William. That's a mere 170 mile round trip if we come back via Glencoe. I would love to take in the awesome Mallaig road, the Eilean Donan Castle, Loch Carron and Applecross, there's so very much we ought to see while we're here but the miles and the time are against us. After the epic ride yesterday I reckon 170 miles is enough. We have to start the day with some bike care, some breakfast and some domestic duties. After the eating and the washing up there's chains that need oiling and RG is poking around under the top yoke again. "Could do with some snips." I give him the snips I have in my tool tube. Some fettling later he declares "That should do it. It would be better if I had a zip tie or two." I give him a couple of zip ties from my bag. I feel all smug inside for being so organised. Best keep these things well looked after. It's s good job I'm not in a rush. the day is already wearing on by the time we leave. The BP garage at the southern end of Pitlochy is, much to my surprise, quite reasonably priced. 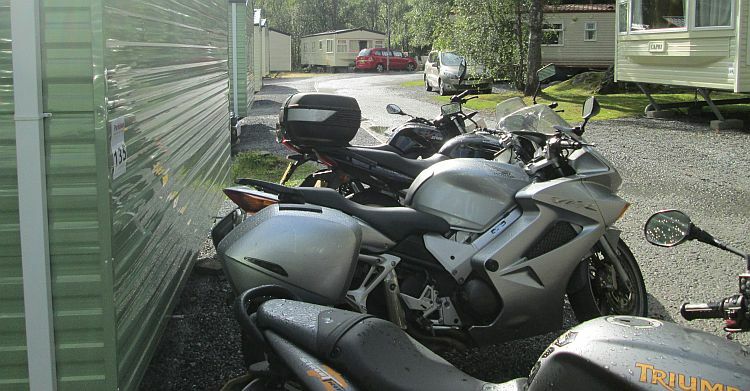 BP garages aren't usually cheap, highland garages aren't usually cheap either and so the combination of the two should be extortionate. Nope, about 3p a litre more than back home and 2p a litre more than the cheapest supermarkets in the area. I don't need fuel, I'll save that 1p a litre and wait till Morrisons at Fort William. It's not a bad price compared to other places in the area. The A9 north is the major trunk road for northern Scotland. It really should be dual carriageway all along, if not a motorway. It's not, it's mostly single carriageway with random sections of 2 lane or dual carriageway. This means anything slow causes massive tailbacks and frustration which causes dangerous overtaking. There's not many lorries this far north so today the slowest thing is the gf on the 125 struggling into a headwind. We sustain 55 mph but I can see the que forming. All 4 of us watch our asses and when the road allows we make our best efforts to allow the cars past. In fact it's not too bad and the cars give us fair space and time. We're only on the road for 20 rather boring miles until we pull off at Dalwhinnie. This is the bit I love about Scotland. "OK, left at the first Junction onto the A86. Left again at the second Junction onto the A82. Both signposted Fort William. 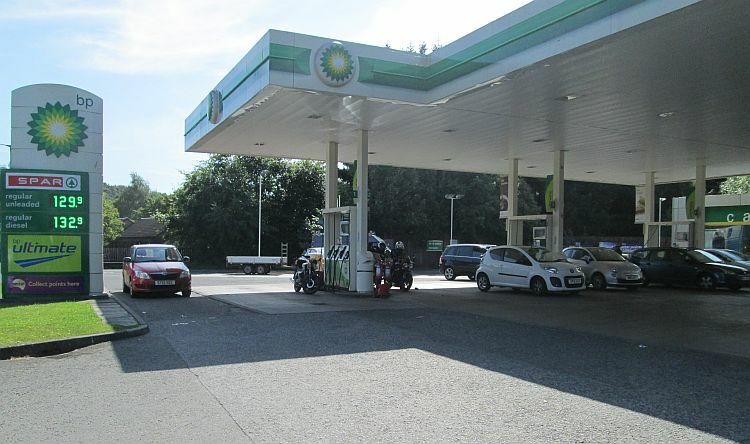 Stop at the BP garage a few miles before Fort William." These are the only instructions required for the next 44 miles. RG understands, JR, gets it and even the gf can manage that. It means we can all ride at our own pace without fear of getting lost and losing each other. RG doesn't need asking twice, his VFR vanishes over a hill and I can only assume his rate of progress will be swift. JR sets off with some fair old gusto too, I think she's liking these roads. I, being the perfect gentleman, make sure the gf is safely on her way and then say "sod it" and give it large on the happy handle too. Scotland's Highlands are beautiful. They are rugged, remote, sometimes bleak and massively vast. We ought to appreciate this countryside, relish in the space, admire nature and take in the tranquillity. Regrettably all this remote wilderness means the roads twist and roll in a delightful manner and there's very little traffic. What I actually see is a blur of greens and browns as I carve and curl along the strip of grey stuff while my engine screams. Oh such sweet blissful joy! It's so lovely and yet I whizz past it all. I stop from time to time to allow the gf to catch up. I've been hammering the 250 for 10 miles and I guess the gf's been pottering along singing ditties in her helmet, stopping to look at the pretty flowers and skipping gaily through the meadows. So why is it she's only about 60 seconds behind me? She's not ripping the tarmac up but she's making solid, steady and very positive progress. When I'm slowed by the odd car or coach I get that feeling of coming home again as I look out over a loch and to the mountains in the distance. I love this place. Here she comes...and there she goes. JR and RG are waiting for us at the BP station. JR's not normally an aggressive rider but she goes on and on and on about how much fun and how fast that road was! RG is just grinning, I know that feeling. I've spotted 2 French bikes with 2 French couples, presumably touring the area as we are. In an attempt to be friendly and practice my Franglais I get talking to them.They are politely impressed by my high school French but of course their English is far better. They're taking in all the best routes and all the best places, they are going to have an amazing time. Hot damn I love Scotland but I want to go back to France and the Alps now. I'm never blooming happy. Bon Voyage! The French couples get ready to ride. Looks like Batty enjoyed the ride too. Morrisons is but a few town miles away and we park the bikes outside the cafe window. Yes, yes I know supermarkets are the same anywhere in the UK and this one is almost a perfect match to the one in Carlisle, Chorley, Preston, Bolton or anywhere else you'd care to mention. BUT, but where else can you get a reasonable meal at a reasonable price then at the same time buy tonight's tea and tomorrow's breakfast and some snacks and treats? Ha! No, nowhere but a common as muck, same as anywhere else supermarket. All this and cheap petrol too. That's all we see of Fort William. 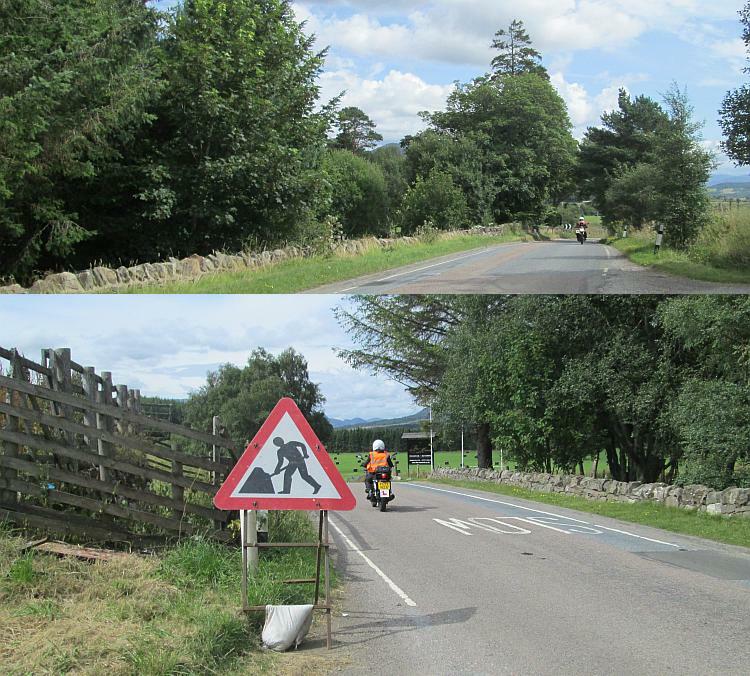 We ride out of town and follow the A82 south along the shoreline of Loch Linnhe. 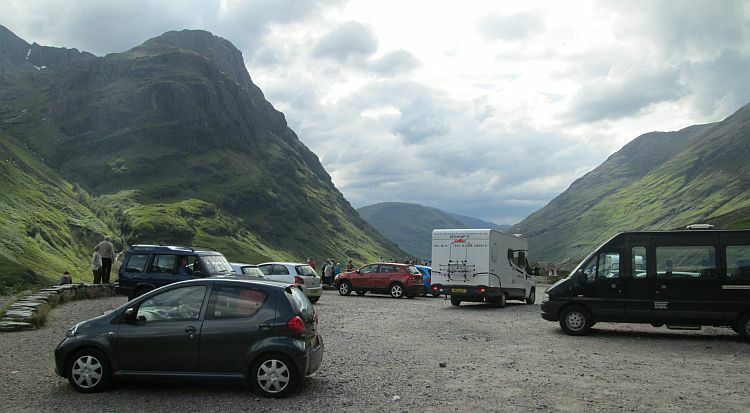 The plan was to simply follow the A82 through Glencoe and Rannoch Moor. As I ride I note time is marching on but there's enough leeway and daylight to make a detour. I spot the sign for Kinlochleven and take the turning. I stop and issue instructions to follow the road into the village and we'll regroup there. RG and I shoot off ahead, the girls can ride at their own pace, it's only 9 miles to the village. I can see RG is holding back a little to allow me to keep up. He's got more power than I and I suspect he's probably faster in the corners too. I'm at 95% of my ability, he looks like he's at 50%. We roll and twist, corner and curve, rise and fall then power and brake. It's a roller coaster this road, I've ridden it a few times before. My heart is racing, I feel both scared and thrilled. You can't do this anywhere else in the UK. There's tiny little patches where you can get up to speed but here there's 10 miles. Some places in Scotland there's 30, 40, 50 and even 100 miles of tarmac, quiet, peaceful, grippy tarmac. RG stops as the houses come back into view. I'm buzzing and beat up, RG looks calm. Damn. The ladies catch us up in a matter of moments. I've had my thrills so as we follow the road back along the opposite side of Loch Leven I ride slowly and take in the views. What a beauty! The road runs high along the valley walls and we can look down over the water and along the valley, far out to the mouth of the loch and beyond. Glencoe is something of an anomaly. It is impressive, it is vast and magnificent and it is ruined by tourists like myself. We park and gawk along with the rest of the car drivers, bikers and coach patrons. At least this time there's no piper murdering what once could have been a tune. I'm thankful we don't stop too long. Impressive, if a little touristy. Glencoe. The road from Glencoe, through Rannoch Moor and down to Tyndrum is in a good mood today. I've seen this road in the rain, the wind and the cold, today it is merely cool and blustery. I park on the bends overlooking the road as it crosses the vast moorland and attempt to take a picture of the gf as she rides across. She's too far away, she's but a mere few pixels on my camera. I sense a touch of pride to see her on the 125 riding across such a wild place. That blob of orange and black is the gf on Rannoch Moor, dear reader. 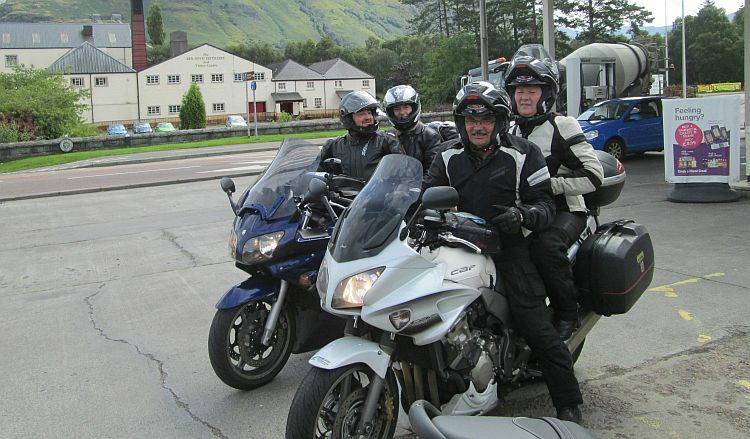 Tyndrum and the Green Welly provide another brew stop and a chat with a biker on a Triumph Bonneville. The rest of our route home is the same as the route we followed as we came in last night, Crianlarich, A827 Killin and then the narrow gritty B846 to Tummel Bridge. 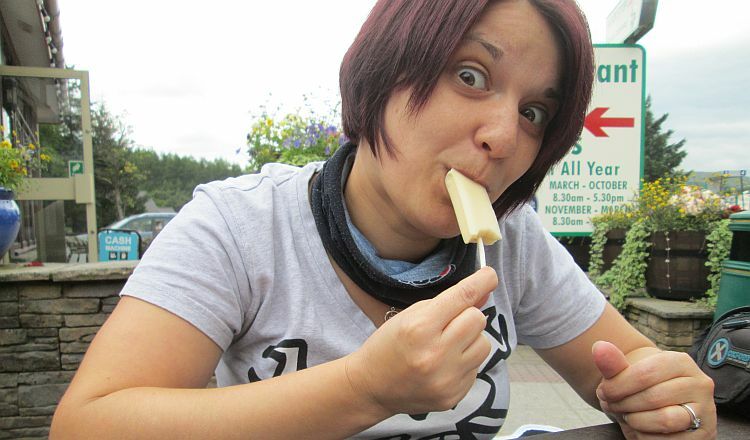 Cheese...on a stick? JR at the Green Welly, Tyndrum. It is pleasing to hear that JR is loving these roads and the gf, although a touch frustrated by a lack of speed, is loving them too. RG just keeps grinning, I think he likes them. The day is almost done now but because we went to the dullness of Morissons at dinner time we can dine on chilli, rice, pasta and whatever else we purchased. We sit to watch nonsense on the TV and relax before an early bed. Another cracking day. And I am still grinning. Going to see if I can get another deal for next year as well. Reading this makes me appreciate how very lucky I am to live just west of Inverness and get out weekly on these roads. It's easy to get used to it . Don't think I could live with a 250 though ! Yep, you're a lucky soul there Brian. That said I have 2 points in my favour. Firstly although Manchester is a very wet city it's probably not quite as wet, wild and windy as Inverness. Secondly is appreciation. Living there as you've pointed out it becomes "normal". You can perhaps take for granted the great roads and amazing scenery in the same way I take clean fresh drinking water from my tap for granted. I on the other had sat here in the grimy gritty industrial wasteland of North West Manchester for 48 weeks each year will fully appreciate the wonder of The Highlands. Would I swap? Hell yeah! 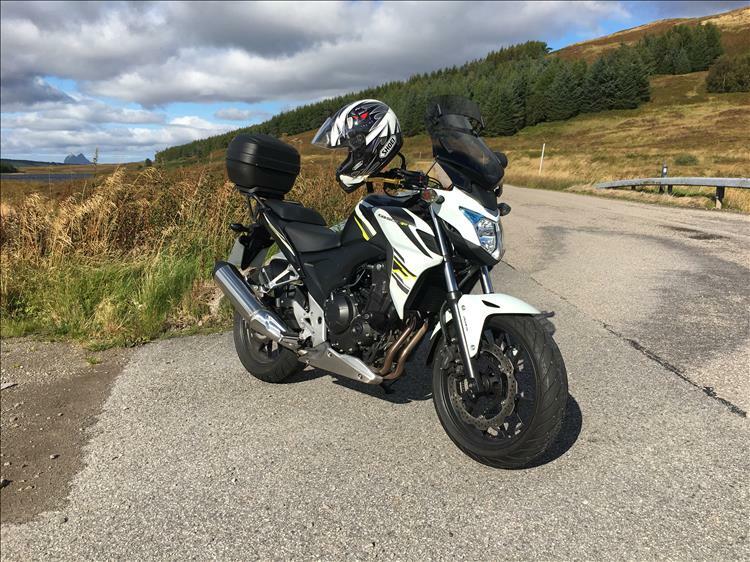 Is there any work for a work shy computer nerd and motorcycle blogger in Inverness? Actually it's not as wet as people think. Lived 20 years near Caernarfon and that was wet. Being retired can pick and choose my days out . Often the weather is better in different directions as the Great Glen seems to be the divider. If you are ever in the area let me know. Did a Scandinavian tour last year which I can recommend for excellent roads too. Right...thanks...great...just rub it in why don't you. So it doesn't rain as much as I thought. So if it is raining just head across country and you'll find somewhere drier. And you've been to Scandinavia. I'm so envious now I feel sick! Then to cap it all of you've got a lovely CB500F too. Pffffft. And you're retired. Well erm...er...erm...I've got more bike shops near me? Sharon and I will be up that way sometime next year as we pass through doing the NC500 with a group of folks we know. You can make us a brewski and we can sit in your back garden basking in the ever glorious Scottish sunshine Brian. I'm glad you're enjoying the bike, the countryside, the weather and your retirement. Just don't tell me that you've got a nice garage and workshop too otherwise I'll explode.